Vladimir Kapustin, Art Director for Inflight Review magazine, used our Photo Jumble software to create the beautiful mosaic for this magazine cover. 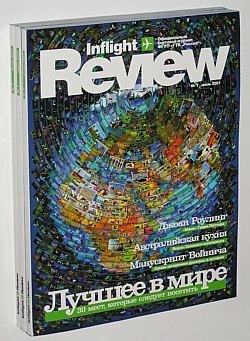 Inflight Review was founded in 1990 as Russia’s first official in-flight periodical. In 2005, this glossy full-color dual-language Russian/English news & entertainment magazine was awarded "Best In-Flight Periodical, Russia" in New Wings' annual competition. With a monthly circulation of over 70,000 copies, it is distributed free of charge on all Rossiya State Transport Company flights. For more information about Inflight Review please visit their official site: www.spn.ru. Vladimir Kapustin selected Photo Jumble for preparing the July 2007 Inflight Review magazine cover because it is the only software that is able to create mosaics with freely defined cell positions. As every mosaic cell is represented as a separate image layer, cells can be easy: moved, resized and/or rotated. To achieve the desired "global" composition they needed a circular array of photographic cells. Photo Jumble was designed for exactly these kinds of tasks and accomplished it with aplomb, while alternative mosaic programs allow only regular grid-shaped cell structures. Additionally, Kapustin wanted to enlarge some key cells to stress picturesque places. Given that Photo Jumble allows free and easy cell resizing, it was the only suitable application for the task. The ability to do picture placement along a spiral was absolutely revolutionary for us in laying out this image. That feature alone completely solved our primary challenge. If I was stuck with only the option of a simple grid, I'd think long and hard before deciding to use mosaic software for a cover like this. Below is the detailed real scan of the magazine cover.